I only have 1st and 2nd season in NTSC. That's how I buy NTSC stuff and they ship just fine to EU. Here's some silliness I came up with for cleaning up the problem scene in the PAL version. I don't know how long it stays that way as I only have the short sample domator uploaded. It doesn't fix it completely, but you'd probably have to hunt for what's left to notice it. Last edited by hello_hello; 20th March 2019 at 20:24. Well, hello_hello, it does look great. I don't understand it but it does look great. Are you deleting here frames with Trim() using any pattern? There's no pattern, except the blending seems to change on a scene change. Some of it caused by de-interlacing the existing blending (I think), which is why I changed de-interlacing methods. Divided into three sections, 0-724 is clip "B", 725-807 is clip "C" and 808-0 is clip "D". "B" uses the original TFM field matching/de-interlacing. "C" uses TFM again, but with blending as it's de-interlacing method. TDeint was being used too but I just realised it's pointless so I'll edit the script to remove it (I tried several things). "D" uses TDeint to bob de-interlace to 50fps. The end result was mostly a pattern of blended and non blended frames, and the blended ones are removed with SelectOdd(). For that scene it worked better than TFM's de-interlacing. That did leave three blended frames on scene changes, so I fixed them manually with extra Trims. Replaced frame 293 from clip B with frame 293 from clip D.
Frame 724 was a lost cause so I replaced it by repeating frame 723. A repeated frame on a scene change is usually unnoticeable, at least compared to a blended frame. 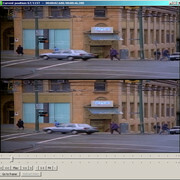 Replaced frame 966 from clip D with frame 966 from clip C.
I followed all that with QTGMC in progressive mode to clean it up a bit. I didn't upscale as to be honest I think it's pointless (except for animation), so I just cropped and resized to 4:3. Last edited by hello_hello; 20th March 2019 at 20:27. That looks very good with my German PAL-Source. Stutter, no glitches, and it seems that also scenechanges are good. I am doing this complete episode now with a test-run, takes about 1,5 hours, will control it and report tomorrow (its late-evening right now). But it seems that its VERY VERY good work. This might work for all episodes! So, I though it must be: Still problems some scenes later. Overall some doubled frames, not only at scenechanges, but also some blendings coming up. Those scene is ok, very good work on it, but there are still some shifts in whatever. This is what I got months ago, if I got one scene right, some other failed. I think you cant belive of that there is nothing you can get shure that its fixes, the fixed ranges might be the problem. Last edited by mbcd; 20th March 2019 at 21:19. These sources use to change "field dominance" irregularly and steplessly. With "field dominance" I meant which of the two fields is displaced. While changing the "dominance" fields are blended. SRestore with frate=25 gives reasonable results. - Try it, or buy NTSC. For these sorts of problem, when I really care, I tend to encode a whole episode using the field matching or de-interlacing that mostly works, then I watch the encode and make a note of the problem sections. I'd re-encode them again, trying to fix the problems, and later split out the bad sections and replace them with the fixed versions. It can involve a bit of work... obviously... and it pays to always add --stitchable to the x264 command line if you want to append encoded video. Sliders, like MANY shows from the '80s and '90s, was shot on film but edited on tape for NTSC audiences. It will have 60 hz effects and orphaned fields everywhere even when you're dealing with a clean NTSC copy. Converting it to PAL absolutely destroys it. Solution: get the NTSC discs. If I ask "How do I do X?" or "what happens if I do X? ", and X is a very bad thing that no one would ever normally do, assume that I already know this, and that I have Katie reasons for asking anyway. While you may well be right, don't make such statements unless you know them to be correct for this particular source. It's not helpful. And if anything, it would be more likely to have 30Hz effects than 60. Last edited by wonkey_monkey; 22nd March 2019 at 10:22. Here's my latest theory. I didn't like SRestore when I tried it originally, but I think that's because Yadif was de-interlacing. When I switched to QTGMC it was better. The only problem is in a few places there's duplicate frames where (I assume) SRestore took out a frame with blending, when it probably would have been better to leave a slightly blended frame instead (you can see a break in movement as the car goes past the pole, as the guy in the blue jacket walks past the group, and three or four times as they walk down the stairs). So I checked the sample and there only seems to be two patterns of frames to keep using FixBlendX instead of SRestore. You have to decide where to use each pattern yourself, but it solves the problem of repeated frames. but it leaves two blended frames on scene changes, so if you're very fussy.... for the blended frame in clip B, I swapped it out for the same frame in clip C, and for clip C I swapped the frame out from clip B. Wouldn't it be nice if the whole episode could be done with just two patterns, even if you have to find them yourself? Edit: Doh! Changed the script below so it only has to de-interlace once. The downside is de-interlacing does blur fine detail a bit more than using TFM(), even with QTGMC. Maybe one of QTGMC's lossless modes would work better here. Normally when I'm looking for the frames to keep with FixBlend, I'd de-interlace with Yadif(mode=1) and replace it with QTGMC() for encoding. This is the first time that hasn't worked. Last edited by hello_hello; 21st March 2019 at 09:17. You did a great job here , hello_hello! Trimming frames from the whole series might be a bit too much work to no go crazy. I think they did the conversion from whatever source automatically. Such guys are lazy. If they weren't lazy they would do this properly and this is not done properly. So in theory whatever they applied to get so much blurring and interlacing should be possible to undo. I mean- there should be a pattern here. Here's some silliness I came up with for cleaning up the problem scene in the PAL version. It might be possible to detect automatically which version is the best choice for each frame. There are algorithms that calculate the "blurriness" of the frame and I guess the most correct one should have the least blurriness. I did implement such a measure as part of B-SSIM metric. As I said, fixed value are a no-go here, for me it looks like they did some motion blurrer, as more movement, as more blending ... but I am not a professional. But I agree: Manually adjusting stuff is not the way, too much work! As far as I can see the only part that is mostly NOT working with this settings is the scene with the scanner and the directly following entering the foodplace. All other seems to work fine, so this scene has something special, thats why I advised to it. Last edited by mbcd; 21st March 2019 at 20:52. As far as I can see the only part that is NOT working with this settings is the scene with the scanner and the directly following entering the foodplace. All other seems to work fine, so this scene has something special, thats why I advised to it. Splitting out that one scene with Trims to use a different FixBlendX setting doesn't sound like too much work. Some/most of it must have out of alignment fields and that's why TFM() on it's own does the job. For the section we've been playing with there's oddities I don't understand. You can see there's nothing unusual about the first few frames where the car goes past. When it switches back to the shot of the group there's blending in the odd fields only. And it's constant. The even fields are nice and clean (except for one field on the scene change). For a normal field-blended conversion, the odd fields will be blended for several fields, then the even fields for several fields, but (ideally) never at the same time. When you bob de-interlace, the fields become full frames, so there's always a fairly clean version of each frame, and SRestore or FixBlend etc can be used to pick them out as it normally happens in a fairly constant pattern. It stays that way until the shot where they walk through the scanner, where it switches to the even fields being the one's with constant blending, and the odd fields are clean. Once again the only exception is the scene change, where the odd field is also blended. That's no doubt why the blending on scene changes is somewhat harder to remove in the usual way. It's also why TDeint(mode=1).SelectOdd() mostly worked for that section. After bobbing, every second frame is blurred and SelectOdd keeps the good ones. TFM() doesn't work for the blended field sections because ultimately it's trying to pair non-blended and blended fields, and then it has to de-interlace the blended parts. You can really only fix it with bob-deinterlacing (to make each field a frame) and then remove the blended ones, but because it's such an odd thing, I can't find an automatic way to do it. Maybe zorr will return and offer some suggestions. Theoretically, the following should be fine for the whole episode, and hopefully the "B" clip will cover most of it, but where it doesn't you'll have to switch to either the "C" clip or the "D" clip using Trims, according to whichever one has no blended frames. If there's only a few short problem sections it shouldn't be too much work. For the scene changes you'll have to pick the least offensive frame. If there's other problems.... well... that'll be another bridge to cross. I've no idea how it ended up the way it is. And a scene change where a single odd field is also blended. Last edited by hello_hello; 21st March 2019 at 22:41. THank you VERY VERY much for your affort here, I remember the blendending switches from odd to even fields, you are right with that. I check that right now, takes some time. I also check yout last suggestion out ! Last edited by mbcd; 21st March 2019 at 21:43. SRestore normally works by just picking out the non-blended frames after bobbing (as far as I know), so it doesn't actually deblend (although it must look for it). Except for it's mode for deblending progressive 29.97fps video that was creating by blend de-interlaced telecined material. It can deblend that pretty well, as long as the pattern is fairly consistent, but if it's not truly blend de-interlaced telecined 29.97fps, it puts out all sorts of horrible artefacts, so it must rely on a consistent blending pattern. Anyway.... it seems if you change the field TFM matches from to the bottom field where the top fields are blended, when it de-interlaces, it must interpolate the pixels from the unblended field with new ones, and therefore seems to deblend the frame. I'm guessing... but I can't think of another logical reason as to why it works. When the bottom fields are blended, you field match from the top field, which is the default for a top field first video. Same for the sections without blending. At least the above way you can get benefit from QTGMC's cleaning up the video, but it'll be much faster than bobbing with QTGMC. I aso tried an encode with TFM taking the combed pixels from QTGMC while still running QTGMC in progressive mode to clean up the rest. I think it's an improvement bit it's also slow. Check out the railings in front of the windows as they walk past. The version with TFM using QTGMC's de-interlacing is more stable, but maybe it's not worth the hit on encoding speed. That all works, but I'm really not all that sure I understand why at the moment. Last edited by hello_hello; 22nd March 2019 at 04:45. I am giving up again guys, chances are not bad to get a better result out of this source, but it looks like it is not possible to do it automatically. By hand with about 88 episodes is a no-go. Last edited by mbcd; 22nd March 2019 at 13:00.